The Genetti Family Genealogy Project makes history personal and real. It allows you to experience life through the stories of your ancestors. 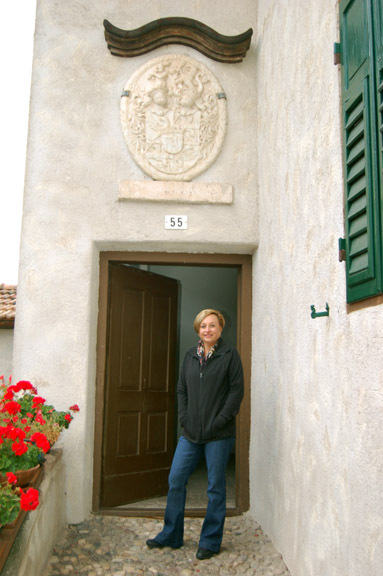 Louise Genetti Roach, webmaster, at the Genetti homestead in Castelfondo. Louise Genetti Roach is the great-granddaughter of Cosma Damiano Genetti, Oliva Zambotti, Giovanni Battista Marchetti and Catterina Lucia Fellin. All were immigrants from the Val di Non region of the former Austrian Tyrol. Louise’s “bis nonni” (great-grandfathers), were from the little village of Castelfondo and among the first Tyroleans to immigrate to the United States in the 1870’s. Inspired by the genealogy-based television show “Who Do You Think You Are”, Louise has been researching her family ancestry since 2010. Using online resources, conversations with family members, family trees, visits to the Val di Non and microfilm copies of records dating back to the mid-1500’s, she has collected a vast anthology of Genetti genealogy. This website/blog, the ever-growing reconstructed family tree and a family e-book that Louise is currently working on are the culmination of her research. Through this website and ongoing blog posts, Louise shares her passion of family history and Tyrolean cultural with the goal of connecting Genetti descendants throughout the world.